United Nations Secretary-General Antonio Guterres (L) sits next to Malian Army General Didier Dacko, Force Commander of the G5 Sahel, an institutional framework for coordination of regional cooperation in development policies and security matters in West Africa, in Sevare on May 30, 2018, during Guterres' two-day visit to Mali. UNICEF is warning that hundreds of thousands of severely malnourished children in Mali are at risk of dying, as the security situation in the country worsens. The United Nations reports that attacks by extremists and criminals in northern and central Mali are rising at an alarming rate, with many civilians being deliberately targeted. UNICEF spokesman Christophe Boulierac says hundreds of thousands of children are going hungry because of severe food shortages. "More than 850,000 children under the age of 5 are at risk of global acute malnutrition this year, including 274,000 children facing severe malnutrition and at imminent risk of death," he said. "This represents a 34 percent increase and is largely due to the worsening food security situation in parts of the country." The U.N. reports 20 percent of the country is suffering from food insecurity and 1.2 million people lack water, sanitation and basic hygiene. UNICEF says severe acute malnutrition rates are highest in the conflict affected areas in the north, exceeding the emergency level of 15 percent in Timbuktu. It cites Mali as one of the countries with the highest newborn and maternal mortality rates in the world. Boulierac also says newborn deaths are rising because of malnutrition and lack of basic health services. Northern Mail has been in turmoil since 2012, when Islamist militant groups temporarily seized control of the region. A Malian Army soldier with the G5 Sahel, an institutional framework for coordination of regional cooperation in development policies and security matters in West Africa, is seen in Sevare on May 30, 2018. ​On a visit to Mali's capital Bamako on Tuesday, U.N. Secretary-General Antonio Guterres paid homage to the U.N. peacekeepers who have been killed while serving what is considered the world body's most dangerous peacekeeping mission.Twenty-one peacekeepers were killed in attacks by extremists last year. 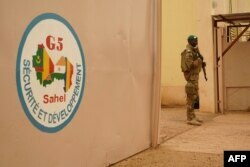 While in Mali, Guterres appealed for funds to support the G5 Sahel force, which is composed of troops from Mali, Niger, Chad, Burkina Faso and Mauritania.The force was created to contain the West African jihadists active in Mali and nearby countries. UNICEF calls the crisis in Mali one of the most forgotten in the world. It notes nearly 80 percent of the agency's $37 million humanitarian appeal for this year remains unfunded.